If I know some of artist blog friends who followed Tim Holtz's 12 tags of Christmas, these will be very familiar. Tim made his roses out of grungepaper but I wasn't lucky enough to have any so I made these beauties out of regular cardstock. Unfortunately the picture does not really show the distressing very well. I also lack paper cutting machines so off to cyber space looking for a flower template for a 6 petal flower. After a few processes of elimination I found one. If you use the bottom left hand flower it is the perfect shape for roses. You might want to put this in an editing program crop the flower then resize to make your rose. 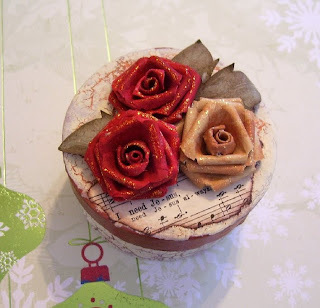 My size was about 1 3/4 inches, remember the layer of the rose will eventually get smaller as you follow Tim's tutorial but the base size is great for this. I found 2 inches was a tad too big.
. You want to smell them that is how nice they look. I didn't do the centers quite like Tim, I am a quiller as well so I put my quilling tool to good use and was able to get some nice folds in the centers. Not bad for paper I say. This little box will be holding a nice little Christmas pressie for a good friend. OMG Les! This is completely gorgeous! You did a wonderful job! If this was meant for a present, I envy the giftee! Can't wait to try these out. Hi JeanieBeanie, you have to try these, your first one might take a bit to do but after that they whip up pretty fast. Tim liked them too!!! Wow, your gift box is beautiful Les, those roses are just stunning!! I might be somewhat biased :) but I think that your roses are beautiful, Well done sweetheart! I would think that whoever is getting this as a gift is a very, very lucky person. Very nice roses, Les. I love them, but then I love roses!!! Those are wonderful! That's a beautiful box. Great roses. I think the quilled bit in the centers is perfect.